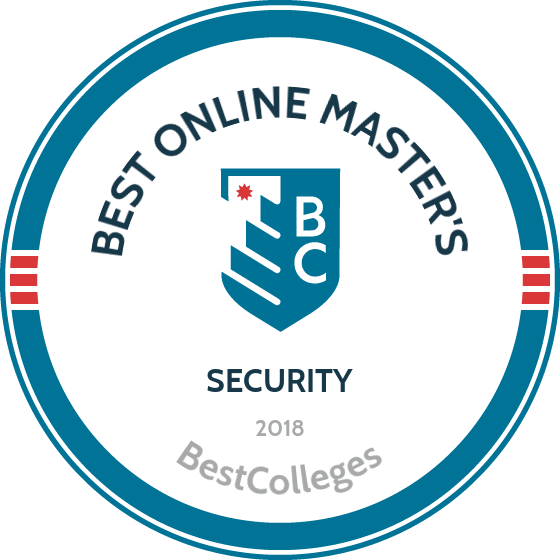 What are the Best Online Master's in Security Programs? What Else Can I Expect From an Online Master's in Security Program? Security professionals protect human, material, and information assets. They collect and interpret data in order to create defense networks and response procedures. Longtime experts can even anticipate and safeguard against crises long before they occur. An online master's degree in security studies prepares you for a lucrative career in expanding fields such as financial risk management, international business, counterterrorism, and homeland security. The U.S. Bureau of Labor Statistics (BLS) projects security jobs will grow through 2026, including a remarkable 28% increase for information security analysts. The proper education and professional experience empowers you to not only enter these professions, but also advance into leadership roles and shape the future of security in the U.S. and abroad. Whatever your career aspirations, the right master's degree in intelligence and security studies online program can help you achieve your goals. Northeastern University’s master of science in security and resilience studies program explores the ways in which secure infrastructures promote resilient social systems. Focusing on topics such as counterterrorism, urban resilience, cyberspace policy, risk management, and infrastructure protection, this 30-hour master’s degree in security studies may be competed in around one year. Along with required courses such as security policy, international security, and critical infrastructure, students may choose a concentration in cyberspace policy, resilient cities, counterterrorism, or administration, management, and policy. In addition to core coursework, students must complete an experimental capstone course, which serves as the culmination of the program. Northeastern University holds regional accreditation from the New England Association of Schools and Colleges, Inc., the Association to Advance Collegiate Schools of Business, the Commission on Accreditation in Physical Therapy Education, and the National Association of Schools of Public Affairs and Administration. This Fort Lauderdale university offers 48 fully online master's programs, including a master's of science in national security affairs and international relations. Instilling the research, applied, and theoretical skills needed to excel in security affairs, the 36-credit curriculum emphasizes the critical analysis of contemporary national security issues. Students learn to interpret current and historical trends in security and intelligence collection and analysis, as well as related theories, ethical issues, and US foreign policy and national security. Prior to earning a master's degree in intelligence and security studies online, students must pass a comprehensive examination in their final semester. Along with a completed application, prospective students should provide a current resume, a brief personal essay, an academic writing sample, and two academic or professional recommendations. Nova Southeastern University is accredited by the Southern Association of Colleges and Schools Commission on Colleges. The University of Denver’s security management master’s program trains students to assess risks, examine security threats, and create security solutions through research, case studies, and discussion. The 48-hour program imparts the skills needed to protect individuals, organizations, intellectual property, and physical assets through an in-depth study of foundational security concepts, as well as specialized coursework in emergency response and hazardous material preparedness. Available concentrations include organizational security, information security, and emergency planning. All 12 courses are 10 weeks long, and the program culminates in a capstone experience. While GMAT or GRE scores are not required for admission, applicants must hold an undergraduate degree from a regionally accredited college or university, with a minimum cumulative GPA of 2.5 over the final 60 semester credits. In addition to an application, all must provide official transcripts, two references, a resume, and a personal statement. Students may transfer up to 12 credit hours toward their degree. The University of Denver is accredited by The Higher Learning Commission. East Carolina University’s master of science in security studies features a multidisciplinary format that exposes learners to a variety of perspectives on safety and security. The 36-credit curriculum focuses on four major areas: homeland security policy, environmental health and occupational safety, science and technology security, and international security. In addition to required coursework in foundational security, security policy, and research methods, students complete both an internship and a four-course emphasis in their chosen focus area. While the program includes thesis and non-thesis tracks, all students must pass a final comprehensive exam. Most full-time learners earn their MSSS in around two years. Prospective graduate students must hold a bachelor’s degree from a regionally accredited institution, and should include a resume, statement of purpose, and letters of reference with their completed application. East Carolina University is accredited by the Commission on Colleges of the Southern Association of Colleges and Schools. Students enrolled in UMass Lowell’s security studies graduate program can earn either a master of arts or a master of sciences degree through the same 30-credit curriculum. The program is committed to developing the next generation of security professional and scholars via academic education and professional development. These interrelated components are designed to offer students a world-class education in the different facets of contemporary security threats and responses to these challenges while creating a community of security professionals. The program features concentrations in homeland Defense, International Security, Cyber Security, Industrial and Economic Security, CBRNE Security and Critical Infrastructure Protection. Hence students gain a deep understanding of issues such as terrorism and counterterrorism, weapons of mass destruction, security policies, cyber-security, civil wars and much more. Applicants must have completed an undergraduate degree at an accredited institution, achieving a final undergraduate GPA of 3.0 or above. The University of Massachusetts Lowell is accredited through the New England Association of Schools and Colleges. To maintain government and industry accreditation, online master's degrees in security studies must adhere to certain academic standards and professional development outcomes. This often translates into similar core requirements across programs. However, beyond these base similarities, degree pathways vary greatly based on departmental focus and individual student needs. Contemporary security studies: This course provides all future security professionals with an overview of current practices in the field. Topics include strategies in crisis management, professional leadership, and theories in data gathering and analysis. Students also research and discuss contemporary challenges in security studies. Network infrastructures: A fundamental course for information security specialists, this class trains students to effectively use applications and implement protocols for computer information systems. Topics include network architecture programming interfaces, routing and data linkage, and emerging network technologies. Students also learn key administration skills, including how to install, configure, and automate popular network-based services. Digital forensics: This course trains cybersecurity professionals to identify, extract, and preserve electronic data. Students also learn how to recover data from operating or file systems. The course teaches students how to handle digital data in an ethical and law-abiding manner, so that the information they present can be used in legal proceedings if necessary. Homeland security and terrorism studies: Combining theory with application, this course is required for border and homeland security professionals. Topics include types of terrorist threats and changes to domestic and foreign security policies in the wake of 9/11. Students also analyze and discuss case studies in contemporary counterterrorism measures, including successes and alternatives to current practices. Information regulatory compliance: Focusing on enterprise-related information security, this course benefits professionals who want to work for private businesses. Students learn how information is governed -- and therefore how risk can be managed -- on a mass organizational level. Key principles include government compliance with regard to e-documents, instant messaging, mobile and cloud computing, and social media. How Long Does It Take to Get an Online Master's in Security? Online master's degrees in security studies require at least 30 credits and generally take two years to complete. Curricular differences between programs can affect how long it takes to earn your degree. Certain capstone and internship experiences may take longer than others. And while remote courses are usually asynchronous, some schools hold real-time online sessions to encourage group work and discussion. Similarly, programs can structure their coursework in a cohort learning style, which requires you and a small group of peers to progress through the program as a group, usually taking one class at a time. This option benefits nontraditional students who need to juggle work and school obligations, but may also lengthen the time needed to graduate. For maximum flexibility, seek out a master's degree in intelligence and security studies online that offers individually paced learning, accelerated classes throughout the year, and the ability to complete internships where you live or with your current employer. (ISC)² Information Security Certifications: A global leader in the field, (ISC)² provides 10 professional certifications for information security professionals. Options include recognition for general practice and specialized certificates for cloud computing, software lifecycle, and security architecture. Entry requirements vary for each certificate, but candidates must possess a certain amount of paid work experience. GSHNSP Homeland Security Professionals: In conjunction with the National Sheriffs' Association, the Global Society of Homeland and National Security Professionals offers two certification pathways: the introductory certified homeland protection associate (CHPA) and the advanced certified homeland protection professional (CHPP). While the first few levels of the CHPA don't require college education, the remaining certificates as well as the CHPP require at least an associate degree. U.S. colleges and universities must maintain national and/or regional accreditation in order to bestow valid degrees. Organizations under the auspices of the U.S. Department of Education (ED) and the Council for Higher Education Accreditation (CHEA) confer national accreditation. National accreditation signifies a school's adherence to academic standards defined by both the federal government and CHEA. This official backing also grants schools access to important resources such as federal funding. The ED and CHEA grant national accreditation through subsidiary organizations. The ED is a government entity whose mission includes ensuring that schools work with the federal government when it comes to curriculum planning, testing, and program outcomes. Established in 1996 as a private nonprofit, CHEA advocates for educational research and the rights of its 3,000+ member institutions. For more information, check out the ED and CHEA websites. Regional accreditation is granted by one of six organizations, depending on where the school is located. Similar to CHEA's mission, these organizations ensure that colleges and universities standardize their curricular outcomes and professional support services. Generally speaking, employers prefer regional over national accreditation due to the fact that they must engage with local and state authorities more intimately. Ideally, you should enroll in a school that holds both forms of accreditation. Additionally, a program may possess professional accreditation from organizations such as the International Assembly for Collegiate Business Education. Using data from PayScale, the table below details five popular career choices for security professionals, along with their average salaries. This information suggests that the primary determining factor for salary is work experience, though education, professional training, and certification also contribute to pay increases. An online master's degree in security and risk management equips you with the theoretical knowledge, best practices, and hands-on experience to pursue entry or advancement in growing fields such as law enforcement, public policy, and information security. Security specialists have exceptional critical thinking and leadership skills that enable them to handle sensitive situations effectively. Many work in group settings as managers and counselors, while others perform their tasks independently as analysts and private investigators. Intelligence analysts provide information about security threats for government agencies, contractors, and private businesses. These professionals typically digest large amounts of data along with confidential or classified information. They may need to be familiar with automated systems like databases, imagery analysis, and signal intelligence. A bachelor's degree in a relevant field is usually the minimum requirement. One of the fastest growing careers, these security professionals implement and manage systems that protect their organization's sensitive information. They also monitor systems for security violations and investigate breaches. Information security analysts must obtain advanced computer and IT skills, usually through a graduate degree program and specialized professional certification. Providing crucial security and civil services to their communities, military personnel may occupy combat-specific roles or pursue civilian careers as doctors, nurses, lawyers, engineers, or linguists/translators. The military offers professional advancement resources such as leadership training and funding for college. While an online master's degree in security studies prepares you for a variety of job opportunities, it may also be helpful to receive external support from professional associations. Membership in a professional association provides additional networking, research, and funding opportunities that are important for career success. Organizations usually charge an annual membership fee, but in return you receive academic scholarships, research and project grants, and access to discussion boards and job listings. Many even give substantial discounts on the price of conference attendance and training seminars. Most professional organizations host workshops such as the SANS Institute's live security training programs. With over 130,000 members, (ISC)² is one of the leading IT and cybersecurity organizations in the U.S. The consortium offers certification programs as well as traditional and online skill training classes. As the top homeland security professional organization in the country, GSHNSP provides certification pathways and training programs. Members may attend skill development workshops in leadership, school-based threat response, and tactical shooting for law enforcement. Founded in 1961, the AITP currently boasts over 4,500 members. The association supports the advancement of the IT field by facilitating webinars, research, a conference, and other networking opportunities. The AITP also runs an integrated career center and grants awards for professionals and students. Established in 1989 as a collaborative education and research initiative, the SANS Institute focuses on certification and training programs. Members can access live opportunities all over the world or can develop their skills through convenient online classes. A nonprofit international organization dedicated to advocating for the IT and security fields, ISSA offers a wealth of professional development resources, including awards, a career center, and a competitive but impactful fellowship program. When conducting research on online master's degree in security studies programs, you should strongly consider affordability in addition to how each school fits your professional interests and goals. Student loan debt not only cripples you financially, but can also inhibit your career advancement opportunities. The Free Application for Federal Student Aid (FAFSA) enables you to sign up for several loans and awards simultaneously. Additionally, you should look into funding opportunities from community, professional, and government organizations, including scholarships from the CIA and the American Society for Industrial Security.